Gazi Sansoy, The 4rd Siege of Vienna and Refugees, 2016–17. Oil on canvas, 285 x 350 cm. Co-curated by Huma Kabakcı and Mine Küçük, a group exhibition titled Past meets Present willshowcase a selection of works by 16 Turkish and international artists at Anna Laudel Contemporary from September 7 to October 13, 2017. All participating artists come from different artistic and cultural backgrounds yet their individual art practices are informed by a shared interest in the research, excavations and discoveries of historians, scientists and archaeologists. The multi-disciplinary exhibition will feature works by artists including: Sami Aslan, Burçak Bingöl, Hera Büyüktaşçıyan, Ahmet Civelek, Onur Hastürk, Patrick Hough, Bilal Hakan Karakaya, Seçil Kınay, Hasan Kıran, Maude Maris, Ardan Özmenoğlu, Murat Palta, Shahpour Pouyan, Gazi Sansoy, Elvan Tekcan and Pınar Yolaçan. The curators of Past meets Present, Huma Kabakcı and Mine Küçük, stated that their curatorial vision for the exhibition drew inspiration both from the specific historical context of the exhibition space, which served as the Ottoman Post Office in the early 20th century, and from the international outlook of the Anna Laudel Contemporary gallery. Having long been influenced by the idea of redefining the past through contemporary art, the curators will invite visitors to explore and participate in a historical journey through contemporary art practices. The exhibition will also present a programme of parallel activities as part of the 15th Istanbul Biennial, including a curatorial tour, an artist talk and a performance installation entitled Body—The Present Flowing into the Past presented by TORK Dance Art. Past meets Present will be held across three floors of exhibition space at Anna Laudel Contemporary in Istanbul until October 13, 2017. Based in Istanbul and London, Huma Kabakcı graduated from BA Advertising & Marketing at London College of Communication in 2011, and later on received her MA in Curating Contemporary Art at Royal College of Art (London). She worked and interned in various galleries, museums and auction houses, both in the UK and Turkey. These include Sotheby’s New Bond Street (Contemporary Art Sales department), The Albion Gallery (London), Pera Museum (Turkey), as well as three major collection exhibitions she worked on in museums during the 2010 Ruhr & Pecs Capital of Culture project. Since graduating from Royal College of Art (London), Kabakcı founded Open Space Contemporary and has been collaborating with various projects and organisations including Alt, Artkurio, Block Universe, IKSV, Open Dialogue Istanbul, The Art Department and SALT. Kabakcı co-curated Memory and Continuity with Esra Aliçavuşoğlu, a selected exhibition from the Huma Kabakcı Collection at the Pera Museum (February 24 to May 8, 2016) amongst other recent projects. She has contributed to various publications including Guggenheim Blog and Ibraaz Online Publication. Kabakcı recently completed her Mphil in Curating and is continuing her PhD at Royal College of Art, London. Based in Istanbul, Mine Küçük received her BA degree from Istanbul University in Prehistoric Archaeology and worked as an early Bronze Age specialist at Troia, Turkey. She received her MA degree in Ancient Studies and Museum Studies from the University of Minnesota. During her studies she interned at Istanbul Archaeology Museum, Science Museum of Minnesota, and the Bermuda Maritime Museum. Soon after her graduation she worked for the Science Museum of Minnesota as a content specialist, exhibit developer, and project manager for the Çatalhöyük Project. Upon her return to Istanbul she coordinated European Union projects and worked as a content specialist with Swedish partners. In addition to teaching Museum Studies at Yeditepe University, she has developed educational programs around archaeology, museum studies and art for institutions, schools, foundations and private companies. Currently she works as a curator and freelance consultant for various projects in areas of her expertise. She also trains exhibition guides for the International Biennials in Istanbul. Anna Laudel Contemporary was founded by the German textile magnate Anna Laudel with the aim of supporting the work of Turkish and international artists by providing a prominent contemporary exhibition platform and through developing a greater understanding of and closer appreciation for contemporary art within the Turkish region. 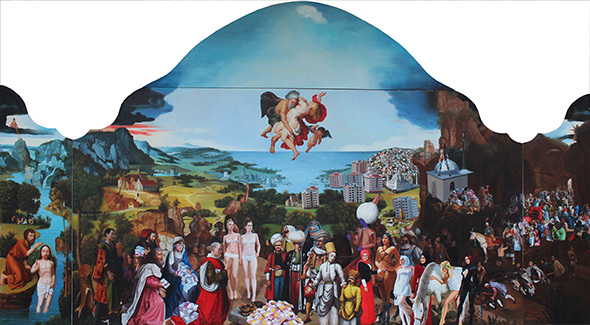 Launched in December 2016 in the old finance district of the late Ottoman Empire in Karaköy, within a historic building boasting a vast exhibition space spanning five floors, the gallery hosted five exhibitions including two solo shows by internationally renowned master Fernando Botero and the acclaimed sculptor Mehmet Aksoy, with a further three group shows featuring artists from Turkey and abroad. As well as hosting a dynamic exhibitions programme, the gallery aims to represent Turkish artists at an international level by showcasing their latest projects at leading international art fairs. This year, Anna Laudel Contemporary will participate in the 12th edition of Contemporary Istanbul between September 14 to 17 and display the works of the artists including, Andreas Blank, Flora Borsi, Fernando Botero, Ramazan Can, Tuğçe Diri, Bilal Hakan Karakaya, Ekin Su Koç, Jan Kuck, Gazi Sansoy, Johannes Vetter and Serpil Yeter.